House Speaker John Boehner got a bit unplugged during his weekly press conference today, pointedly telling the Senate to “get off their arse and do something” to find a way to avert the sequester.Boehner pushed a familiar refrain during a nearly 10-minute press conference: The House has twice passed legislation to replace the sequester’s spending cuts. Now, the Senate must act. “We should not have to move a third bill before the Senate gets off their arse and begins to do something,” Boehner said. 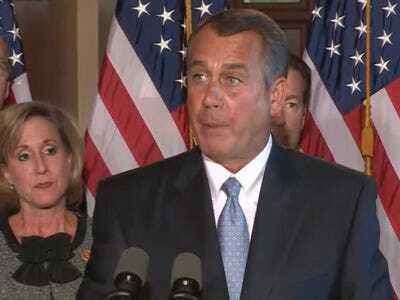 “The House has done its job,” Boehner added. The across-the-board cuts of the sequester are set to begin kicking in at the end of this week. Boehner and other Republicans are locked in a battle with President Barack Obama and Democrats over how to avert those cuts. Obama is set to take his message to Newport News, Va., today to warn about the cuts. The bills passed by the House expired with the end of last Congress. But Boehner said that wasn’t an excuse for the Senate.